Discuss episodes from Drabblecast’s alternative feed. This story was ok, but kind of hard for me to follow. Who exactly had the cages? What actually happened? Too much inferred, too little stated. tbaker2500 wrote: This story was ok, but kind of hard for me to follow. Who exactly had the cages? What actually happened? Too much inferred, too little stated. Hm, it came across pretty clear to me. The main tension in the story rises when the shopkeep's new prissy wife begins bringing back all sorts of treasures and mysterious things from 'the old country' to sell in the shop (this included the bizarre critters alluded to in cages). Rather than face this disgrace and blasphemy, the shopkeeper says he would rather see it all burned to cinders than sullied and pawned off for profit. 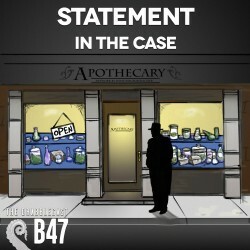 The investigation (and story) is all about the events that might have caused the burning down of the store and death of the wife. It's also alluded at the end that some of the strange creatures from the old country had possibly escaped. I dunno, it really worked for me!